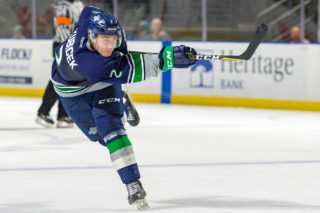 KENNEWICK, December 7, 2018 — Goalie Cole Schwebius had 21 saves Friday night at Toyota Center in Kennewick to help lead the Seattle Thunderbirds to a 4-1 victory over the Tri-City Americans. Schwebius had six saves in the first period, seven saves in the second period and eight saves in the third period to record his first WHL win in net. Schwebius’ record this season is now 1-2-1-0. 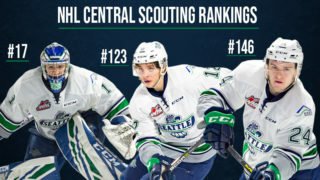 The T-Birds host the Everett Silvertips Saturday at accesso ShoWare Center at 6:05pm. The T-Birds are expecting the biggest crowd of the season at this game. Cole Schwebius holding the puck from his first WHL win which came on Friday, December 7, 2018, in a 4-1 win at the Tri-City Americans. It took 14 seconds for Seattle (10-13-3-0) to take a 1-0 lead. Off the opening faceoff defenseman Jake Lee passed the puck up the left wing to Nolan Volcan who tipped the puck into the Americans zone. Matthew Wedman chased down the puck behind the Tri-City net and won a possession battle. Wedman sent the puck to Zack Andrusiak, who kicked the puck with his right skate to his stick, in the low right circle. Andrusiak beat Tri-City goalie Beck Warm through the legs for his 19th goal of the season. The T-Birds outshot the Americans 14-6 in the first period. Tri-City (14-12-1-1) tied the game 1-1 at 9:55 of the second period on a power-play goal by Nolan Yaremko. Kyle Olson and Aaron Hyman had the assists. A pretty passing play from Noah Philp and Andrej Kukuca set up Dillon Hamaliuk for the go-ahead goal at 1:42 of the third period. Philp had the puck in the left circle and headed towards Warm then passed the puck behind the Tri-City net to Kukuca. Kukuca quickly sent the puck to Hamaliuk in the slot. Hamaliuk beat Warm over the glove for his ninth goal of the season. Simon Kubicek made it a 3-1 T-Birds lead at 11:24 of the third. Kubicek took a slap shot from the point that missed the net, rebounded off the end boards and then off Warm and into the Tri-City net. Jake Lee and Kukuca had the assists on Kubicek’s seventh goal of the season. Playing 4-on-4 the Americans pulled Warm with 3:23 left in the game. Wedman won a puck battle in the neutral zone, got to the red line and sent the puck towards the Tri-City net. The puck just snuck inside the right post at 17:39 for Seattle’s fourth goal of the game. The goal was Wedman’s ninth of the season and was unassisted. Seattle outshot Tri-City 13-8 in the third period and 43-22 in the game. Warm had 39 saves on 42 shots and his record is now 13-12-1-0. First period – 1, Seattle, Andrusiak 19 (Wedman, Volcan), :14. Penalties – Yaremko, Tri (high-sticking, major-fighting), 4:40. Tyszka, Sea (slashing, major-fighting), 4:40. Hyman, Tri (tripping), 5:48. Kalinichenko, Tri (kneeing), 9:51. Second period – 2, Tri-City, Yaremko 13 (Olson, Hyman), 9:55 (pp). Penalties – Bouchard, Tri (roughing), 7:22. Hamaliuk, Sea (goaltender interference), 8:39. Lee, Sea (delay of game), 19:03. Third period – 3, Seattle, Hamaliuk 9 (Kukuca, Philp), 1:42. 4, Seattle, Kubicek 7 (Lee), 11:24. 5, Seattle, Wedman 9, 17:39 (en). Penalties – Hrabik, Tri (high-sticking), 12:17. Tyszka, Sea (cross checking), 16:36. Johnson, Tri (unsportsmanlike conduct-embellishment), 16:36. 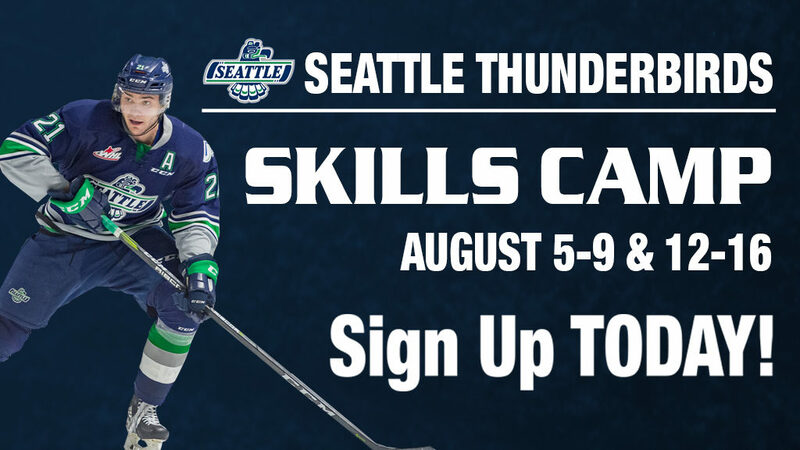 Shots on goal – Seattle 14-16-13 43, Tri-City 6-8-8 22. Goalies – Seattle, Schwebius 22 shots-21 saves (1-2-1-0); Tri-City, Warm 42-39 (13-12-1-0). 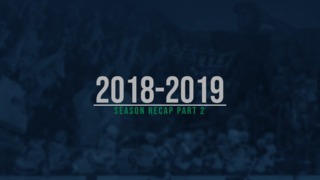 Power plays – Seattle 0-4; Tri-City 1-2. A – 3,214. Referees – Mike Campbell, Nick Panter. Linesmen – Trevor Beaton, Michael Labbe.